Today it is not spring like out at all where I live. This little northern town is still covered in snow. However the snow is finally starting to melt, but it seems we still have a long way to go. This is the hardest part of the year for me as I know back home spring has sprung. 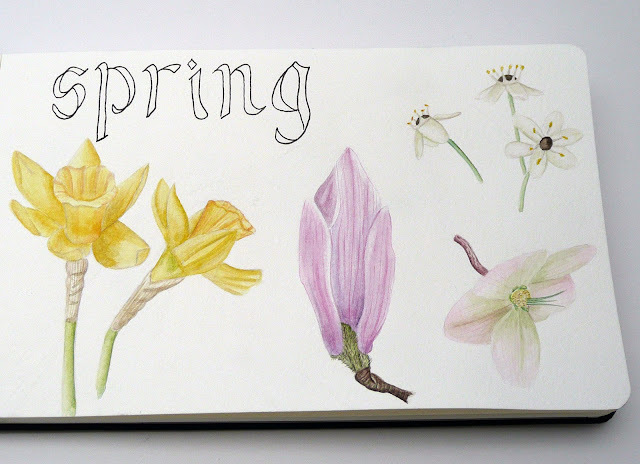 I am and looking at lots of pictures of flowers and books with spring scenes jumping off the pages, trying to keep myself sane and inspired. This is one of my more recent sketchbook pages. I am going on a trip south to see my family next week back to Vancouver Island and I am so excited because all the flowers will be out and the days are getting nice and warm there. That would be great to look out my window and see flowers like this! I love the different hues you incorporated into the star of bethlehem. I *thought* it was spring here, then we got a dusting of snow yesterday. Oh well. At least you'll see slightly nicer weather in Vancouver and maybe find more spring inspiration!